In the W5 star-forming region, the oldest stars (blue dots) reside at the centers of two hollow cavities (other blue dots are background and foreground stars). Younger stars (pink dots) line the rims of the cavities, and some can be seen dots at the tips of the elephant-trunk-like pillars. The very youngest stars are forming in the white knotty areas, with heated dust (red) pervading the region's cavities. A glitzynew family portrait of a star-forming region supports a theory that theuniverse's most massive stars carve out these wispy wombs and thereby enablestellar embryos to take shape. Theinfrared photograph, which will be detailed in the Dec. 1 issue of The AstrophysicalJournal, bolsters a long-held theory of star formation. Stars areborn within clouds of gas and dust that dot most galaxies. Scientists thinkthat turbulence from the wind of other stars within these clouds gives rise toknots of material with enough mass that the gas and dust begins to collapseunder their own weight. As the cloud collapses, the material heats up and forms anembryonic star, or "protostar," at its center. The protostar develops intoa full-fledged star powered by thermonuclear fusion of hydrogen and other lightelements in its core. One theorydescribes a process whereby massive stars, weighing from 15 to about 60 timesthe mass of the sun, can trigger the formation of such clumps of material and,in turn, stellarnewborns. The theorygoes these stars are so hefty some of their material slides off in the form ofwinds. The scorching-hot stars also blaze with intense radiation. Over time,both the wind and radiation blast away surrounding cloud material, carving outexpanding cavities. As thewinds and radiation make more elbow room, gas and dust get pushed against therim of the cavity. Astronomers have long suspected that this compressionignites successive generations of stars along a cavity's expanding rim. 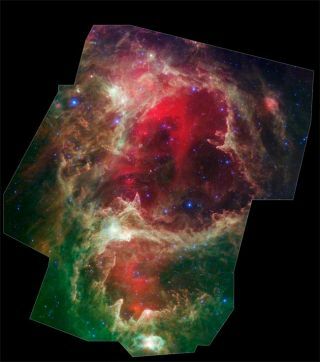 This resultcame into sparkling view with new images by NASA's Spitzer Space Telescope of astar-forming region called W5, which appears to span an area of the sky equalto four full moons and is located about 6,500 light-years away in theconstellation Cassiopeia. A light-year is the distance light will travelin a year, or about 6 trillion miles (10 trillion kilometers). The imageshowed a family of stars that got progressively younger with distance from acavity center. So the elderly, most massive stars sat in the centers of W5'stwo hollow cavities and the younger stars lined the cavities' rims and tips of theregion's elephant-trunk-like pillars. Thisladder-like separation of ages provides some of the best evidence yet, theresearchers say, that massive stars give rise to younger generations. "Triggeredstar formation continues to be very hard to prove," said lead researcherXavier Koenig of the Harvard Smithsonian Center for Astrophysics in Cambridge,Mass. "But our preliminary analysis shows that the phenomenon can explainthe multiple generations of stars seen in the W5 region." The teamplans to follow up the study with more detailed measurements of the stars' agesto see if there is a distinct age difference between the stars just inside andoutside the cavity rim.